Friday’s strong wage numbers catalyzed a significant uptick in yields with 10s rising 6.8 bps to the highest yield since August 8th. One day does not a trend make, but we’ve seen a pretty persistent uptick in yields over the last few weeks. That uptick has been off support that dates back to February. Overhead, there’s been a trend of lower highs since the peak in yields back on May 18th. 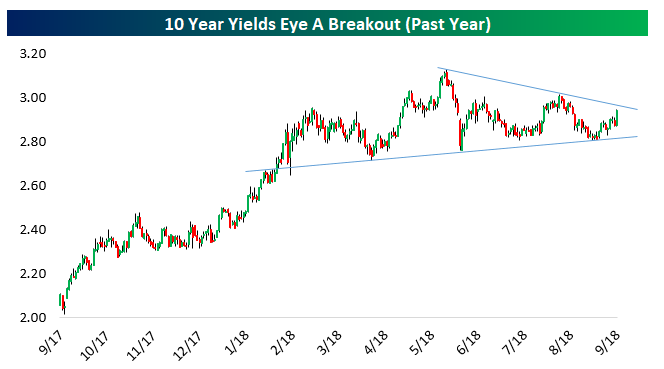 While yields haven’t broken out of this consolidation yet, they’re certainly moving towards it; a close above either overhead resistance or support below would be a technical signal making a larger move more likely.